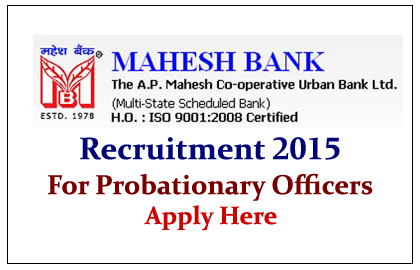 The A.P Mahesh Co-operative Urban Bank Ltd has announced the recruitment notification for the post of Probationary Officers in Assistant Accountant Cadre. Eligible candidates can apply for this post from 31stMarch 2015 to 13th April 2015. Eligible candidates can apply for this post by clicking the link given below or through the banks website:www.apmaheshbank.com .